1H 99.985% H is stable with 0 neutrons. 2H 0.015% 2H is stable with 1 neutrons. Hydrogen is the first element on the Periodic Table of Elements. The word 'Hydrogen' comes from the Greek words 'hydor' (water) and 'genes' (generate). 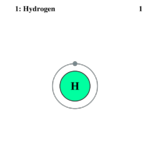 Hydrogen's atomic symbol is 'H', its atomic number is '1', and it's atomic mass is 1.00794. Hydrogen is the most abundant element in the universe and has the least mass of all elements. It is completely colorless, odorless, and tasteless. Hydrogen is known as the most flammable of all known substances, and about 75% of the most abundant compounds contain hydrogen. It is also burned in rocket combustion chambers (engines) to provide thrust for the plane or rocket. Hydrogen can be absorbed by many metals, and it is slightly more soluble in organic solvents than in water. Most organic compounds, living organisms, and water contain hydrogen. Hydrogen is used to upgrade fossil fuels and most recently has begun to be used as a power source for fuel cells. This element is also used in thousands of everyday objects, such as butters, glass, soaps, and many more. Hydrogen has three isotopes: Hydrogen (Protium), Deuterium, and Tritium and is the only element whose isotopes have their own names. Hydrogen is used in fuel cells. Hydrogen has the potential to be a very efficient fuel source. Hydrogen is most commonly obtained as a byproduct of natural gas production, it is also possible to produce hydrogen through the electrolysis of water but this is less efficient for large scale industrial production. One of the biggest uses of hydrogen is a fuel for combustion. Combustion of hydrogen works in internal combustion engines, gas turbines, and in rocket ships or jets. Hydrogen is also used in fuel cells. A fuel cell is a device that produces a continuous electrical current from the combination of hydrogen with oxygen, and/or another substance. For example, fuel cells are used on NASA's Space Transport System or "space shuttle" to provide electricity needed for the operation of the spacecraft. The combination of hydrogen, oxygen, and other substances creates electricity, heat, and breathable oxygen for the astronauts aboard. There are thousands of things hydrogen is used for; it is used to produce: ammonia, gasoline, heating oil, fertilizer, glass, metal, vitamins, makeup, soaps, and foodstuffs like margarine and peanut butter. Also, wind turbines and hydroelectric plants produce hydrogen in order to store energy during off peak times. Scientists have tried to produce a metallic form of hydrogen for years. Since Hydrogen is in the same column of the periodic table as the alkali metals, it has been thought that in environments with sufficient pressure, the element Hydrogen would form a metallic solid. Physicists at the Max Planck Institute for Chemistry in Germany showed changes at 2.3 million atmospheres of pressure. The Scientists, M. I. Eremets and I. A. Troyan, noted that at 300 GPascals, the hydrogen became opaque and reflective as well as having a much lowered resistance to electricity, which could be a major breakthrough in the field. After the pressure was released the (possible) metallic hydrogen apparently returned to normal hydrogen. Hydrogen, unlike any other element in the Periodic Table of Elements, is the only element whose isotopes are named. Hydrogen has three isotopes: Protium, Deuterium, and Tritium. Each of these isotopes have one proton, one electron to balance it, and different numbers of neutrons. Protium has no neutrons, deuterium has one neutron, and tritium has two neutrons. The nuclear symbols of hydrogen, deuterium, and tritium are: ¹H, ²H, and ³H. Deuterium Oxide (D₂0), also known as 'heavy-water', is found in ordinary water and is also used as a moderator in nuclear reactors. Deuterium is used very greatly in scientific research; it has been made possible to study chemical reaction mechanisms because of the use of deuterium atoms as tracers. Tritium (T) is a radioactive gas that is produced in nuclear reactors and occurs often in atmospheric hydrogen. Tritium is used in hydrogen bombs, tracers, and types of paint. The melting point of tritium oxide (4.49 degrees C) is higher than that of deuterium oxide. Both protium and deuterium are stable, but tritium is unstable and has a half-life of 12.32 years. The three isotopes of Hydrogen: Hydrogen (Protium), Deuterium, Tritium. Region of Ionized Hydrogen in Space. Henry Cavendish first discovered Hydrogen as a substance. Hydrogen was first recognized as a distinct substance in 1766 by Henry Cavendish, an English chemist and physicist, who described it as "inflammable air from metals". It was officially named by A. L. Lavoisier in 1783. Hydrogen is found in great abundance in many stars and planets. Molecular hydrogen clouds are also associated with star formation. Hydrogen is most always found in its atomic and plasma states. Hydrogen gas is very rare in planet Earth's atmosphere because of it's light weight. Heavier gases are more common on earth because lighter gases can escape from the Earth's gravity easier. Most of the hydrogen found on the Earth is found in the form of chemical compounds, such as hydrocarbons and water. Hydrogen bonding occurs when two electronegative atoms, such as oxygen and nitrogen, interact with the same hydrogen. Hydrogen bonding is a strong form of intermolecular interaction and attraction. There are many elements that will combine with hydrogen to form compounds, in this case, also known as "hydrides". Hydrogen bonds, which are constantly being broken and reformed in water, have approximately 1/10 the strength of an average covalent bond. Every water molecule can potentially form four hydrogen bonds with the help of its surrounding water molecules. ↑ "Hydrogen (H) - Chemical properties, health and environmental effects." Lenntech Water Treatment Air Purification Holding B.V., n.d. Accessed August 16, 2008. ↑ "High-Aspect-Ratio Cooling Channel Concept Tested in Lewis' Rocket Engine Test Facility." NASA, April 26, 1996. Accessed August 16, 2008. ↑ Vigeant, Margot. "How Hydrogen Can Be Used." Bucknell University, n.d. Accessed August 16, 2008. ↑ "Other uses of hydrogen." <http://www.hydrogennow.org/>, January 2001. Accessed August 16, 2008. ↑ "The Isotopes of Hydrogen." Guide to the Nuclear Wallchart, August 9, 2000. Accessed August 16, 2008. ↑ "Hydrogen: The Isotopes and Forms." The Columbia Electronic Encyclopedia, 6th ed., 2007. Accessed August 16, 2008. ↑ "Tritium." Toxic substances hydrology program, US Geological Survey, December 14, 2006. Accessed August 16, 2008. ↑ "Hydrogen: Discovery of hydrogen and its isotopes." The Columbia Electronic Encyclopedia, 6th ed., 2007. Accessed August 17, 2008. ↑ Clark, Jim. "Intermolecular Bonding: Hydrogen Bonds." Chemguide, 2000. Accessed August 17, 2008. This page was last modified on 29 January 2018, at 15:27.